Koh Chang is quickly becoming one of Thailand’s popular holiday destinations, with its tropical surroundings, coral reefs, marine life and underwater scenery it provides for a memorable diving holiday. 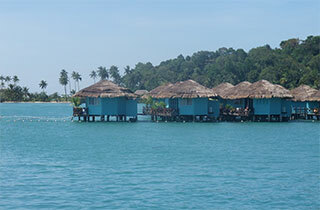 Koh Chang offers a good diving experience, the depth is ideal for both beginners and experienced divers alike. Visibility is between 5 & 15 meters and currents are not normally strong. Groups are a maximum of 4 divers to one instructor. 4 day dives and 1 night dive, return transfers from Bangkok or Pattaya and excellent food. Koh Chang has a number of different dive sites to explore especially in and around the islands in the Koh Chang National Marine Park to the south. We have daily Diving Trips leaving from Koh Chang and offer a number of different Dive Courses. All Dive groups are lead by a Dive Master and we dive in small groups. Full equipment is included. A camera can be hired or we can provide you the pictures of your diving day on cd. Below is a typical package itinerary, if it does not meet your requirements, please feel free to contact us and let us know your preferences. In most cases, we will be able to customise the package to match your requirements.